How many times a day do I hear that complaint? The neck shows its age when the skin be-comes loose, wrinkled and starts to waddle under the chin. Jowls also show up as we age. Improving the neck is difficult. The skin of the neck does not heal as well as the skin of the face. There does not seem to be any “home run” procedure for the neck like there is for the face. Even my patients who have had a surgical neck lift are not always happy with the results. Given that surgery is expensive, painful and with risks, what are the alternatives? Skin tightening devices such as Thermage®, Ultherapy® and Venus Freeze® are some of the nonsurgical skin tightening treatments. They all deliver heat to the deep layers of skin which contracts the collagen and creates tightening. Thermage® and Venus Freeze® use radio-frequency and Ultherapy® uses ultrasound. The results for these treatments are NOT dramatic. The older you are and the more aged your skin looks, the less improvement you will see. Not everyone is a candidate. 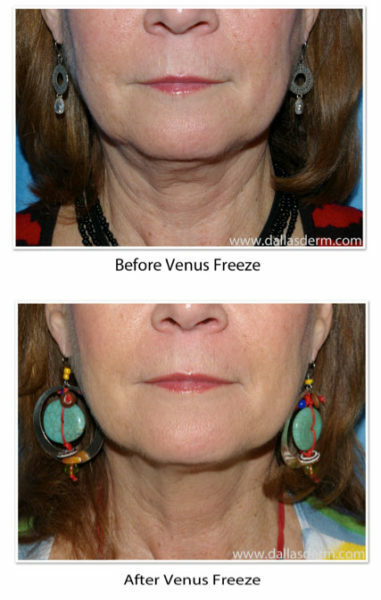 If you are a candidate for Venus Freeze you will need to do the treatment on a regular basis. The goal of treatment is to tighten and smooth the skin of the jaw line and neck. Its is painless, very safe and takes 20 minutes in the office. It is relatively inexpensive compared to the competitors. To get maximal results with Venus Freeze the procedure is performed every one to two weeks for six treatments and then maintenance treatments are performed every four to six months. While patients would ideally like a more permanent solution, the need for repeat treatments is no different than other cosmetic procedures such as neuromodulators ( Botox®, Dysport®, Xeomin® ) or fillers. The patient is lying down for the procedure and a gel is applied to the skin. A four pronged hand piece with roller balls is rolled over and over on the skin of your jawline and neck, it feels very warm. The provider starts on one side of the neck and continues until the skin is heated to 40 ℃ (about 104 ℉ ) and treated for 10 minutes and then the other side is treated. There is some redness to the skin afterwords but it doesn’t last very long, maybe 15 minutes. There is usually some immediate tightening so it looks good if you have plans for that evening. To achieve the best results for the neck we combine Venus Freeze with other treatments. An excellent combination to help smooth and tighten the neck is Venus Freeze with Dysport® (the lesser known botox). Dysport treats the platysma bands. Platysma is a thin muscle in the neck that causes the neck skin to hang in vertical pleats and the Dysport® flattens out those “pleats”. 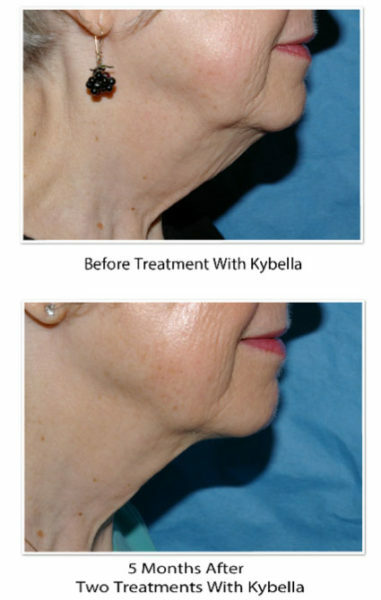 We are seeing great results with Kybella® which was developed to treat fat under the chin. I am finding that even older women who do not have a lot of fat but loose skin under the chin are getting nice results with Kybella®.